The National Park Service turns 100 years old this year and everyone is invited to take part in the celebration! The centennial will kick off a second century of stewardship of America’s national parks and engaging communities through recreation, conservation, and historic preservation programs by inviting you to Find Your Park. Over the next year we’ll help you Find Your Park and discover the national parks and programs here in our own backyard! This month we are featuring the Antietam National Battlefield. Antietam is located in Sharpsburg just one mile from the Inn. It commemorates the American Civil War Battle of Antietam that occurred on September 17, 1862. The Battle of Antietam on September 17, 1862, was the bloodiest one day battle in American history. During that one fateful day, more than 23,110 men were killed, wounded, or listed as missing. Approximately 4,000 were killed, and in the days that followed, many, many more died of wounds or disease. The peaceful village of Sharpsburg turned into one vast hospital and burial ground extending for miles in all directions. The Battle of Antietam ended the Confederate Army of Northern Virginia’s first invasion of the North and led to President Abraham Lincoln’s issuance of the preliminary Emancipation Proclamation. The park was established by the War Department as Antietam National Battlefield Site on August 30, 1890. At that time the park was centered around the Antietam National Cemetery, but the War Department would create the park roads which are still used today with over 300 tablets scattered throughout the battlefield to mark the location of different parts of each army during the battle. With the creation of these park roads many veterans returned for reunions and to place monuments for their regiment or states to commemorate their sacrifices here. There are 96 monuments at Antietam. An Observation Tower was built in 1896 as an open-air classroom for military study. Today the tower provides a commanding 360 degree view of the rural agricultural landscape for visitors just as it did at the turn of the century. The park was transferred from the War Department to the National Park Service on August 10, 1933. Since that time the park has expanded its boundary to over 3,000 acres which include the Dunker Church, the Cornfield, Bloody Lane, Burnside Bridge and many of the pre-war farmsteads like the Pry House Field Hospital Museum. This expansion helped make Antietam one of the best preserved battlefields in America. In 1962 the Visitor Center was constructed with an Observation deck from which you can see 2/3 of the battlefield. You can explore the museum exhibits about the battle and the Civil War, watch a short orientation film or listen to a park ranger interpretive talk at the Visitor Center. The visitor center is open seven days a week from 9:00 a.m. to 5:00 p.m. except on Thanksgiving, Christmas, and New Year’s Day. You can experience the rural landscape, much unchanged since 1862, by hiking one of Antietam’s ten trails. An audio tour is available for purchase to accompany the self-guided 8.5-mile driving tour of the battlefield with eleven stops. The best way to fully understand and appreciate the Battle of Antietam is to book a tour with the Antietam Battlefield Guides by the book store. This group of devoted historians will provide you with a complete historical interpretation of the battle and the Maryland Campaign. There are always special events and activities happening at the park. 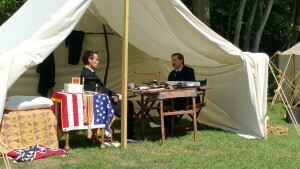 Volunteers are out every weekend to assist visitors, and there are often living history programs. Each July the Maryland Symphony Orchestra’s Salute to Independence Concert is held at the battlefield to celebrate July 4th. The first weekend of December the American Business Women’s Association and the Washington County Convention and Visitors’ Bureau host the Annual Antietam National Battlefield Memorial Illumination in honor of those 23,110 soldiers who fell during the Battle of Antietam. These two events are a must-see; so be sure to add them to your bucket list. Now get out and Find Your Park, visit the Antietam National Battlefield.